By mid-October 1914, the regulars of the British Expeditionary Force (BEF), outnumbered but fighting back alongside our French and Belgians allies, had stabilised the situation. They were defending the strategic but exposed town of Ypres, preserving BEF access to the Channel ports. Trenches ran 400 miles south to the Swiss border and warfare had changed from ‘mobile’ to ‘static’. The Regulars were exhausted and depleted; infantry reinforcements were now being drawn from the Territorial Force (TF). In October, reservist sailors of the RNVR had briefly deployed to Belgium as infantry, virtually untrained, with a Royal Naval Division to defend Antwerp. From North-Western England, the Liverpool Scottish and the 1/6th Bn, The Cheshire Regiment from Stockport landed in France in November 1914. The Liverpool Scottish had mobilized to Edinburgh under canvas. 12th September 1914 (Edinburgh): The men, not yet served out with greatcoats have much to grouse about; in fact the temper of all in camp is far from good. We are only half-equipped and each day we have something more taken from us. Capt. Fairrie thinks K of K [Lord Kitchener of Khartoum, Field Marshal, national hero and War Minister] means to shelve Territorials for the new army being formed. They refuse to give us more rifles and equipment. 6th October: Dinner was disgusting and the Orderly Officer advised us not to eat it, grand advice when you feel starving … battalion ‘scouts’ got a good tea at Porto Bello baths. … We "sent out" for a 2d [equivalent of 1p] fish and chip supper. 16th October: Orders to move to Tunbridge Wells … to take a full battalion of trained men (men who had fired their classification), others to go to Altcar to fire; this put them in a big fix, as half the new draft had not fired a shot … I was one of the first to be taken, although the only time I had fired a rifle was at Sedbergh School ten years before. Surprising Tunbridge Wells, by whistling the French ‘Marseillaise’ on the march, the battalion billeted in private houses where many were treated as family members. Receiving orders for France, they were re-equipped at the last moment. 29th October (Ferguson): The new rifles and equipment placed in company dumps … strange that the War Office fit a battalion out one day, asking them to leave the country the next! It looks as if things can't be going well in France? … we are not nearly ready …. They have rigged each man out well with the best and most up-to-date things and it is no doubt they will look ‘it’ when they do get away. 1st November (Ferguson): I will ever remember that fine sight - 500 of Liverpool's best nearly all six foot high, the very best our City could produce. I stood at the salute while they passed but saw few as my eyes would keep filling with tears; most were singing, a few were crying. It was a fine but very, very sad moment. The station was closed to the public but just before departure, the order was given to admit the families. Those who were unable to find their boys were nearly frantic, a Mrs. Ferguson of Formby imploring me to find her boy. I did but the poor lad refused to look out, he was crying on the seat of his carriage. 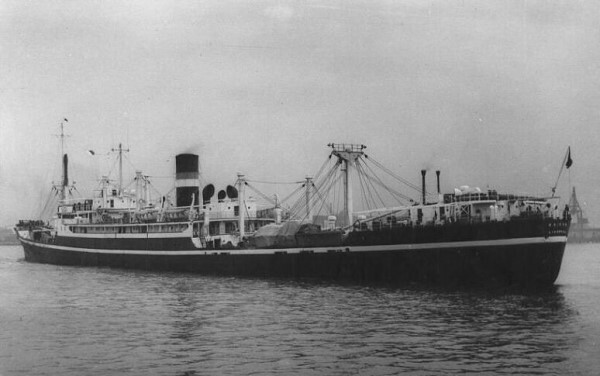 The SS Maidan docked in Le Havre. The ‘Maidaners’, as they became known (one surviving until 1998), marched ashore to rigorous training, the officers armed with sharpened swords that were quickly stored. On 17th November at St. Omer, the Liverpool Scottish, with its Pipe Band, took a major part in the funeral procession of Field Marshal Lord Roberts VC who had died, aged 82, visiting the Indian Army divisions. Lessons were soon learnt. The regimental historian (Major McGilchrist) wrote that their first sight of a BEF company, unshaven, battle-stained and muddied, was a shock but the Territorials noticed ‘Every man's rifle was absolutely spotless, not a bad illustration for civilian soldiers of the distinction between the superficial and the essential’. Captain Bryden McKinnell, the machine gun officer, observed that Regular officers ‘carried all their kit in a small haversack. Our kit has been getting gradually less’. 26th November (McKinnell): Made charcoal for the trenches like the Japs did [Russo-Japanese War, 1904], that is a little smouldering in a bucket with a blanket over, no smoke visible. 26th November (McGilchrist): Captain Wavell [Brigade Major] explained the principles of trench warfare and issued instructions for routine in the line. Some of these, in the light of later experience, were rather humorous ... no smoking whatever, no matches will be struck ... day and night, every other man will be on sentry. The battalion went to trenches near Kemmel Hill, south of Ypres, the next day. Captain Arthur Twentyman, ‘Y’ Company commander, was the first casualty. 29th November (McGilchrist): Only 35 yards to the enemy ... our parapet was repaired at night but … not strong and Twentyman realised that if it did not hold, we would be enfiladed by the Germans ... the sniper was close and when it was light ... he went down through the trench to a dump to get a jam-tin bomb. He came back over the open instead of up the trench thinking a thin hedge would screen him; he was seen and shot down. 30th November (McKinnell): Poor Twentyman was our first casualty. It was a terrible business to get him out. However they will manage to get the wounded out, I don't know. 7th December (Marples): Continuous heavy rain. Put fewer sentries on in daytime and tried to rest, cooped up in a wet trench. Sniping all day, and had great pleasure in bagging a Hun with my first shot. 8th December (Private Sam Moulton, Transport Section): Cooking own breakfast when shells came over and burst in front … all the dirt came over … moved further back on road. Paraded 7 pm at HQ, light marching order - in reserve to the Lincolns who were attacking - lying flat in field for 7 hours - pitch dark- thought we were for it when ordered to cut down the wire fencing in front. Nothing doing! 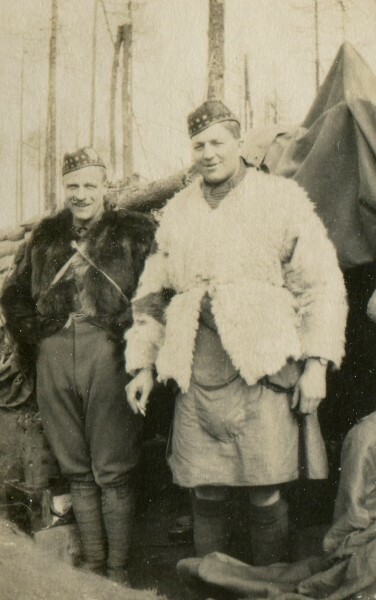 10th December: See Brigade Captain with reference to fur coats. 15 men for telephone instruction, 6 men for Brigade HQ. QM: Rifle oil, boots, glengarries, candles, lime-juice. At home, a Ladies' Committee tirelessly knitted and collected socks, cap-comforters and cardigans. John Rankin, Liverpool ship-owner, gave £60 monthly [about £6000 today] to supplement rations, and ransacked England for Primus stoves. At Christmas, Lord Derby sent plum pudding for every man; great effort went towards making Christmas comfortable. 25th December (Moulton): Three very welcome parcels from home - a real treat - a fine feast at night - mail arrived just after midday on a wagon - greeted with loud cheers. A real Father Christmas … horses instead of reindeer, what did that matter? 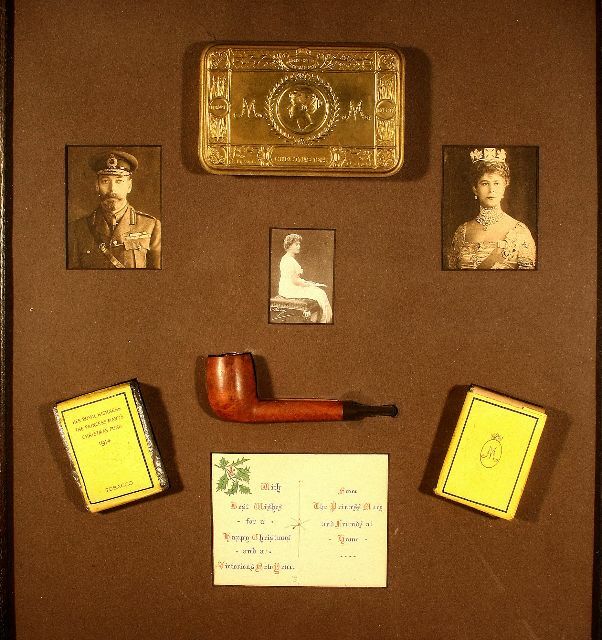 Every man also received a gilt box from Princess Mary - containing a pipe – tobacco …lucky to be out of the line for Christmas and we made the best of it. 30th December 1914 (Moulton): Sick … no duty - too much rich food after rations - since England we have had very little bread, maybe 8 men to 1 loaf - which meant 1 slice each at breakfast. Fried bacon and slice of bread dipped in bacon fat. Army biscuits – Tickler’s plum and apple jam. Army biscuits and cheese - bully beef made up the day's ration. After existing on plain rations, the Christmas parcels - mince pies, Christmas cake etc. - chocolate played havoc with me and many others. 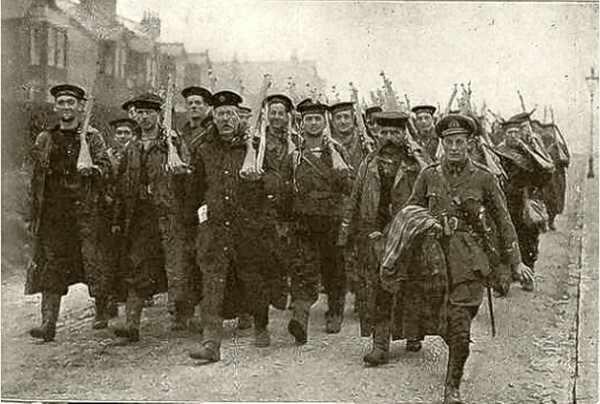 The Liverpool Scottish entered the front line at the end of November 1914, with 855 soldiers. By 31st January 1915, following terrible weather, total strength had fallen to 370. Casualties were mainly ‘sickness’; only about thirty men were killed or wounded. The ‘Captain Wavell’ referred to as Brigade Major of 9th Infantry Brigade became Field Marshal Earl Wavell, later Viceroy of India.